The Smashing Pumpkins’ new album features Billy Corgan, James Iha and Jimmy Chamberlin with longtime guitarist Jeff Schroeder. 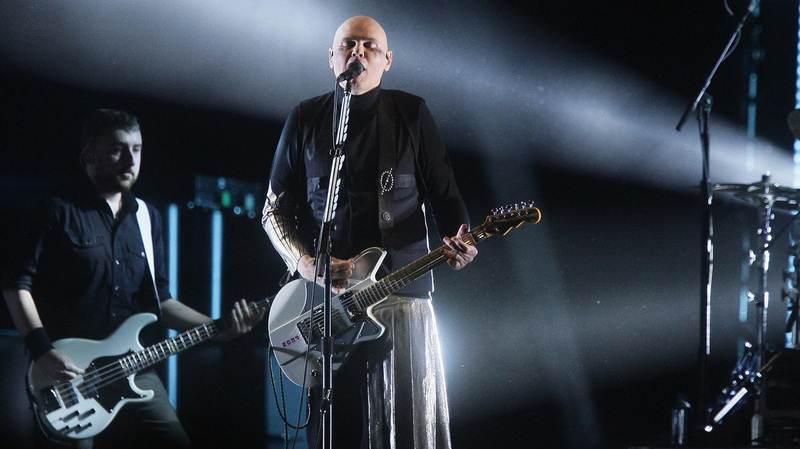 The Smashing Pumpkins‘ Shiny And Oh So Bright tour not only brought most of the band back together — Billy Corgan, guitarist James Iha and drummer Jimmy Chamberlin with longtime guitarist Jeff Schroeder — and some puzzling live collaborations with Sugar Ray’s Mark McGrath, but has also given the band’s new album a name. Originally conceived as a pair EPs, the punctuation-happy Shiny and Oh So Bright, Vol. 1 / LP: No Past. No Future. No Sun. is now a full-length album out Nov. 16 via Corgan’s own Martha’s Music. It’s under exclusive license to Napalm Records, which is better known for releasing heavy metal and hard rock by the likes of Candlemass, Dee Snider and Delain. After public disputes with Corgan, original bassist D’arcy Wretzky will not appear on the album. The news comes after The Smashing Pumpkins premiered “Silvery Sometimes (Ghosts)” on the BBC Thursday, which finds Corgan in a new wave mood, one of his more reliable songwriting modes (think “Try, Try, Try”,” “1979” and its B-sides, the brighter moments of Monuments to an Elegy). “Silvery Sometimes (Ghosts)” comes after the band released hard rocker “Solara” back in June, the first single to feature the Corgan/Chamberlin/Iha/Schroeder line-up.